Ford is upgrading its Sync system, which sparked many customer complaints. Ford is upgrading its infotainment system to make it more like a smartphone or tablet -- and it is dumping its longtime software provider Microsoft as part of the change. Instead, Ford (F) will use BlackBerry's QNX operating system for the new Sync 3 infotainment system. Ford Sync allows drivers to navigate, listen to radio and music, make phone calls and control the car's climate through touch or voice commands. Among Sync 3's improvements will be the ability to expand or shrink the display with pinch-to-zoom gestures. Customers will also be able to swipe the screen's display, as they do on a smartphone or tablet. Sync 3 will also have a better understanding of common voice commands. For example, drivers will be able to give a street address as "eleven-twenty-five" rather than "one-one-two-five." It also will integrate better with the Apple (AAPL) iPhone, allowing users to access Siri hands-free. The old Microsoft-based Sync did not always play nicely with Apple products. Sync 3 will be available next year on Model Year 2016 cars, though Ford spokesman Alan Hall could not say what percentage of cars will still have the old touch screens and which will have the new ones. Because the new touchscreens will include new hardware, owners of the current Sync with MyFord Touch system will not be able to upgrade to Sync 3. The switch from Microsoft (MSFT) to BlackBerry (BBRY) has been rumored since early this year. Sync with MyFord Touch has been a source of many customer complaints. The gripes about Sync have actually hurt customer satisfaction and quality ratings for Ford (F) vehicles in surveys conducted by JD Power and others. The system frequently locks up, has difficulty connecting to a device and it sometimes doesn't understand voice commands. Especially frustrating is Sync's complicated commands to navigate the various features by voice. Hall said Ford's internal survey show it has "turned the corner" on customer complaints and that those who have the current touch screen product are more satisfied with their cars than those who still have the more basic system which only works on voice commands. 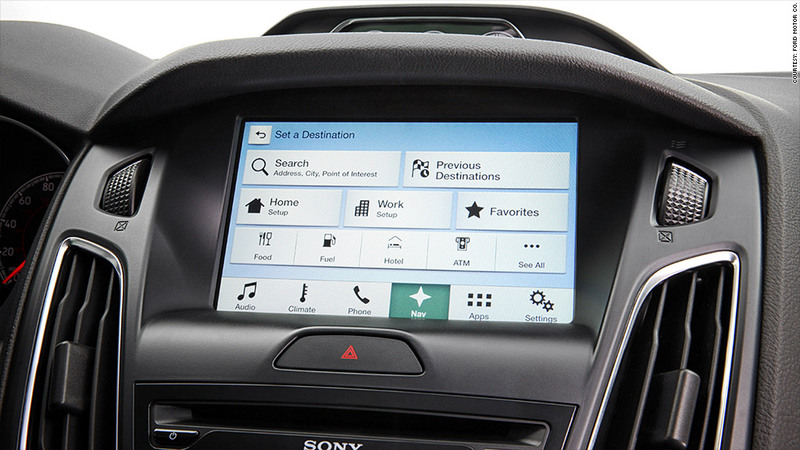 About 55% of Ford drivers have the touchscreens, while 40% still have the more basic system. Sync was first introduced in 2007 -- before Apple (AAPL) introduced the iPhone.